Award at SEDAAG's annual conference. Geography professor Graham Tobin, Ph.D., was honored with the Lifetime Achievement Award by the Southeastern Division of the Association of American Geographers (SEDAAG). Tobin, who also serves as associate vice president for academic affairs, received the award in response to his lifetime contributions to teaching, research and service. He has published five books, eight edited books and monographs, 22 chapters, more than 85 refereed articles and proceedings, 49 technical reports and working papers, 24 book reviews and presented more than 200 academic papers. Tobin also has received more than $1.5 million in grant money as well as served on many university and national committees. 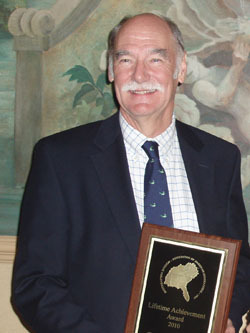 The Lifetime Achievement Award is not the first award Tobin has received from SEDAAG; he also received the Research Honors Award from the association in 2001. SEDAAG is a division of the Association of American Geographers that has more than 550 members.